As the UK moves over to 'British Summer Time' everyone's in the mood for spring. 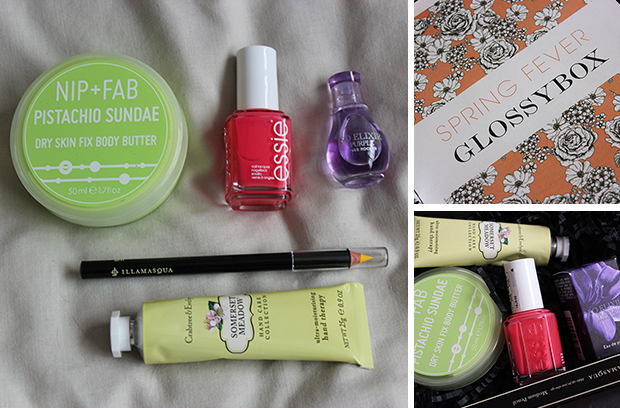 With that Glossybox bring us the 'spring fever' box*. This time around they've shed the regular pale pink box and instead teamed up with designer Pearl Lowe, to create a floral limited edition box. I was so hoping for the coconut scent when I opened my box so was quite disappointed with the one I did get. I'm not a pistachio fan in food form but this butter actually smells like some kind of cookie to me so I don't mind the scent so much. It's not thick like The Body Shop kind and doesn't leave my skin tacky. It sinks into the skin without any effort at all. They have a cherry version I'm definitely keen to try. This is my first Essie. I've been meaning to try them for ages but I was so overwhelmed with the colour choice, I wasn't sure where to start. Cute As A Button is a strawberry/coral shade, perfect for summer nails. It was very almost opaque in two coats, a third completely got rid of any visible nail line. I really like the formula and flow of this polish. It dries pretty quickly and comes with a pro wide brush (favourite kind, makes any polish a winner in my book) so makes application a breeze. I will definitely be keeping an eye out for future collections to see if anything takes my fancy. How cute is this little bottle? I usually don't like perfume vials but this mini bottle is lovely. I'm rubbish at describing scents but this has a floral/woody scent. It smells like a bit of an 'older' fragrance and I don't mean in that in a bad way, I just can't see it appealing to a whole lot of younger people. But you never know. I've not had a chance to try this properly yet but I've loved everything I'd tried by Illamasqua. This is described as a vibrant, canary yellow. It's quite creamy and easy to apply, doesn't tug on the skin at all and has a matte finish. I have a few looks in mind to try with this and will post my results if they're any good. This hand cream has featured in Glossybox in the past (November). This is a different scent and I enjoy it just as much as I did last year. Somerset Meadow is a brand new fragrance launching on the 29th of this month. It contains macadamia nut oil, shea butter and vitamins C and E. I can't quite place the fragrance but it's very fresh smelling and not at all overpowering. It's a thick cream but absorbs into the skin really quickly. When I had this last time, I couldn't stop applying it because it was lovely and moisturising. This has been my favourite box in a while. I got to try some new things I'd been meaning to try for ages but never got to round to. I also got to try things from some favourite brands too. I wasn't super fond of the perfume, seems a bit too grown up for me but I shall be using everything else to prep myself in time for spring.